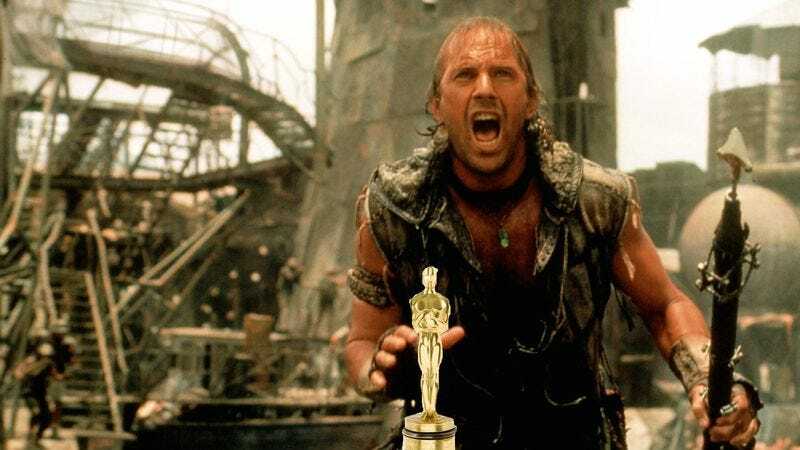 Waterworld, a film synonymous with giant Hollywood flops (regardless of the eventual profitability of the film), has left a bad—one might even say fishy—taste in the mouths of audience members the world over. But there’s an interesting fact about things that taste fishy: Some people actually enjoy that flavor. In fact, it could be argued the fishy taste of awkward dialogue and inexplicable third acts are a beloved addition to the cinematic palate. Which is exactly what Kevin Costner recently argued when he was asked about his most famous misfire. I’m not sure you know how hard people work [on films]. I’m not sure you know how beloved the movie is around the world. Being hard [on a film] is really easy if you don’t know the underbelly of what [went into it]. When you do know the forensics of a movie—the participation and decisions of others that one has to stand in front of—you can’t help but see it differently. While this might read like someone still a little defensive about a notoriously muddled film whose $175 million production cost and creative difficulties were at least partially laid at his feet, there’s another way to see it. Costner’s defended the movie for years, and perhaps is finally realizing the problem: It’s not that it’s a bad movie, it’s that people don’t realize how hard it was to make. Much like critical opinion of The Lone Ranger and Battleship would doubtless turn around, Heaven’s Gate-style, if only everyone understood how hard they were to make, so too will the movie where Costner has gills that look worryingly like vaginas eventually be recognized for what it is. Really, though, Kevin Costner seems okay with people disliking the film, because he genuinely enjoyed making it. “…I know that people might think of Waterworld as a low point for me. It wasn’t. It could have had a better, more obvious outcome. The thing I know is that I never had to stand taller for a movie when most were going the other way. The movie with all its imperfections was a joy for me…a joy to look back upon and to have participated in.” Of course, it’s probably easier to look back with the confidence of someone convinced that everybody but him was at fault for the subpar final product, but still.